EUcoalsizer™. Laser-based online analysis of coal particles. EUcoalsizer mobile is an effective tool for analyzing coal fineness and operating parameters of mills and classifiers. Milos Milic, TPP Nikola Tesla Ltd. The coal particle size spectrum has a strong impact on the combustion process. It influences ignition delay, combustion efficiency and LoI (loss on ignition), the emission levels as well as slagging and fouling. Despite the significance of this property, there has not yet been a robust and easy to handle system for the online measurement of coal fineness inside the pipe. EUcoalsizer solves this problem. 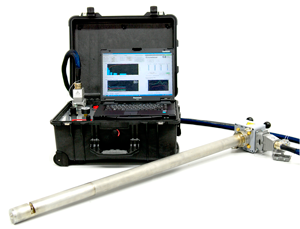 The system measures the particle size distribution and the coal and air flow inside a measurement volume that is placed at the tip of an insertable lance. The results are available in real-time and open up possibilities for optimization.